Impromptus and Moments Musicaux "By Franz Schubert (1797-1828). Edited by Walter Niemann. For solo piano. Classical Period. SMP Level 10 (Advanced). Collection. Standard notation, fingerings and thematic index (does not include words to the songs). 91 pages. Published by Edition Peters"
200 Songs in three volumes "(Volume 1: 100 Songs). 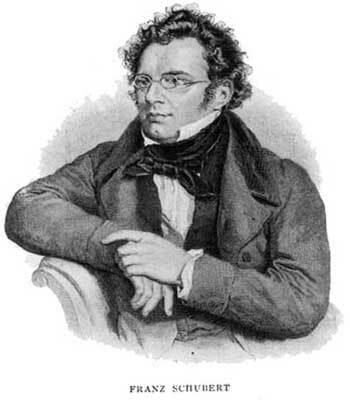 By Franz Schubert (1797-1828). For high voice solo and piano accompaniment (high voice). Contains all the cycles plus 42 Selected Songs. Romantic Period. Difficulty: medium. Collection. Vocal melody, lyrics and piano accompaniment. Mass in G "(SATB). By Franz Schubert (1797-1828). Edited by Robert Shaw and Alice Parker. For SATB choir, soprano voice solo, tenor voice solo, bass voice solo and piano accompaniment (SATB). Choral Large Works. Classical Period. Difficulty: difficult. Vocal score. The Ave Maria Collection "By Franz Schubert; J.S. Bach, Charles Gounod. Edited by Edwin Mclean. For Voice with Piano. The Ave Maria Collection. Sacred. Book. Published by The FJH Music Company Inc"